A recent study by the Rodale Institute brings good news for organic farmers: According to the report, organic agriculture outperforms conventional farming in years of drought, and increases the organic matter content of soil rather than depleting it. Organic farming also uses 45 percent less energy, produces less greenhouse, and is more profitable than conventional agriculture. “Coach” Mark Smallwood of the Rodale Institute provided information about the study, also known as the Farming Systems Trial (FST). Smallwood told me that the FST replicated–over the course of 30 years–what farmers would do on their own farms. The replica plots were 60-feet wide by 300-feet long, which is large enough that they used regular equipment. 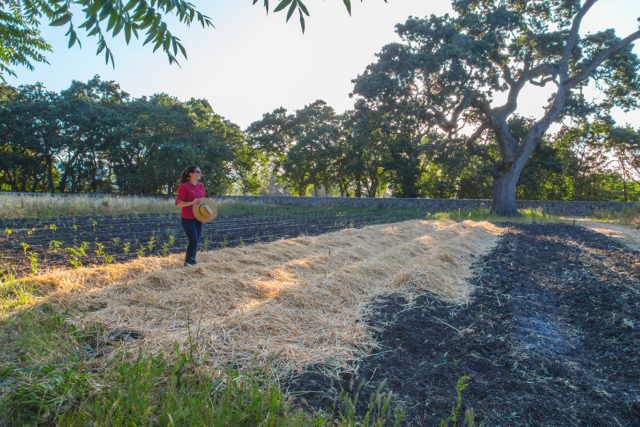 The Rodale Institute used four different treatments for the organic plots: till with composted manure, no-till with composted manure, till with legumes used as cover crops, and no-till with leguminous cover crops. They also used till and no-till methods for conventional crops. They grew their crops using a corn, soy, wheat, and hay rotation. Smallwood mentioned that the nitrogen for the conventional crops came from chemical fertilizers, while, for organic crops, it came from compost. I asked Smallwood about a recent report by the Minnesota Department of Agriculture, which showed that conventional farms in Minnesota had been more profitable than organic farms in recent years. How could that be reconciled with the Rodale reports’ findings that organic farming is more profitable than conventional methods? He replied that the Minnesota study represented only one state, and the Rodale reports are based on the conditions in Pennsylvania. He further mentioned that the average net revenue of organic farmers throughout the United States was 45,000 dollars, while that of conventional farms was 25,000 dollars. Also, the energy inputs for organic agriculture are lower and organic farmers don’t use pesticides, which are conventional farmers’ greatest cost. Smallwood said the reason organic farms outperform conventional farms in years of drought is that the organic matter and beneficial organisms hold the soil together, allowing this soil to act like a sponge and trap water. Conventional farms, on the other hand, don’t have these kinds of microorganisms in the soil, which is therefore not capable of retaining as much water. Smallwood also talked about ways for organic farmers to reduce their greenhouse emissions. He said that saving seeds on small-scale farms is important in this regard. Also, he said that “consumers have recognized local as important” in terms of helping to cut down on the amount of energy inputs and greenhouse gas outputs–and local organic is even better. According to the FST report, in communities around the world where people struggle to feed themselves organic methods have the potential to increase yields by 180 percent over conventional methods. When I asked Smallwood what some ways of implementing organic farming in these places might be, he said that farmers must receive the funds necessary to switch. In order to switch to organic,though, the biology of the soil also needs to be correct. Smallwood told me that the goal of a new FST was to find ways for farmers to transition from conventional to organic. Smallwood said that the findings of the FST report show that organic farming indisputably outperforms conventional farming in several important areas. He mentioned that organic agriculture is a 29-billion dollar industry. Currently, the federal government is spending 127 billion dollars in the current farm bill, and, of that, 124 million dollars (only one percent of the total cost of the bill) are to be spent on organic farming. But six billion dollars are coming back in tax revenue from organic farms, which is 40 times the amount being spent on them. So, according to Smallwood, the government could increase its revenue by funding more organic agriculture.